So you have a LinkedIn account, but do you know how to use it? Join SPJ/ONA DePaul to go beyond the basics. 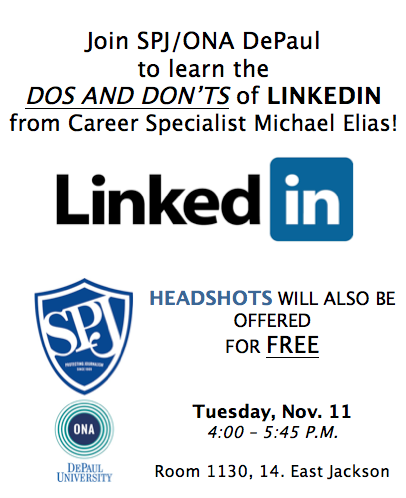 Communication Career Specialist Michael Elias will show attendees how to take advantage of LinkedIn’s networking opportunities to snag a job. 2013-2014 SPJ/ONA President Brianna Kelly will also be on site taking free headshots. You’ll leave with new tips for maximizing your LinkedIn presence as well as a high-quality portrait. Time: 4 to 5:45 p.m.